← Can observations of the ocean help predict the weather? 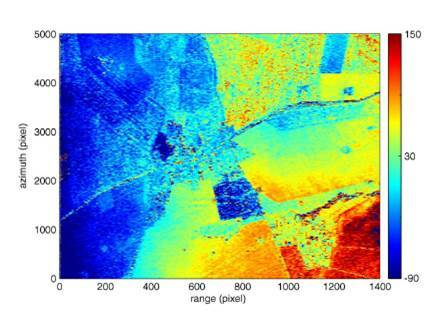 Soil moisture retrieval from satellite synthetic aperture radar (SAR) imagery uses the knowledge that the signal reflected from a soil is related to its dielectric properties. For a given soil type, variations in dielectric are controlled solely by moisture content changes. Thus, a backscatter value at a pixel can be inverted via scattering models to obtain surface moisture. However, this retrieval is complicated by the additional sensitivity of the backscatter to surface roughness and overlying vegetation biomass. For the simplest cases of bare or lightly vegetated soils, extraction of accurate soil moisture information relies on an accurate model representation of the relative contributions of soil moisture and surface roughness. Models to invert backscatter into soil moisture can be broadly categorised into physical, empirical, or semi-empirical. Empirical models have used experimental results to derive explicit relationships between the radar backscattering and moisture. However, these models tend to be site-specific, only being applicable to situations where radar parameters and soil conditions are close to those used in the initial model derivation. Semi-empirical models start with a theoretical description of the scene, and then use simulated or experimental data to direct the implementation of the model. Such models are useful as they provide relatively simple relationships between surface properties and radar observables that capture a lot of the physics of the radar-soil interaction. The key advantages of such models are that they are much less site dependent in comparison to empirical models, and can also be applied when little or no information about the surface roughness is available. Theoretical, or physical, models are based on a robust description of the mathematics of the radar-soil interaction, providing backscatter through a rigorous inversion. Their generality means they are applicable to a wide range of site conditions and sensor characteristics. However, in practice, because the models require the input of a large number of variables it makes their parameterisation complex, and consequently their implementation difficult. As such, semi-empirical models have generally been the most favoured. The approaches outlined above only use the incoherent component – backscatter intensity – to characterise the soil moisture, discarding potentially useful information contained in the phase. Recently, however, a causal link between soil moisture and interferometric phase has been demonstrated, and the development of phase-derived soil products will see increasing attention. The figure below shows the first demonstration of phase-retrieved soil moisture, applied across agricultural fields (De Zan et al, 2014). Here, the differential phase (in degrees) between two SAR images clearly shows delineation along field boundaries, associated with differing moisture states. This entry was posted in Climate, earth observation, Hydrology, land use, Measurements and instrumentation, Numerical modelling, Remote sensing and tagged synthetic aperture radar. Bookmark the permalink.